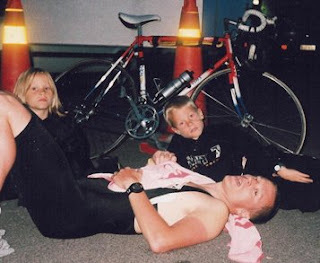 Back in 1984 I signed on to do the first ironman distance ever in Norway . I was 17 and lied on my age to be allowed to enter. I had finally learned to swim a year before, after I almost drowned as a kid. And I screwed it all up a few weeks before the race by doing “Den store styrkeprøven”, 540 km at the bike from Trondheim to Oslo . My knees were totally messed up afterwards and I couldn’t start. Then I spent almost 15 years at the couch, saying “…one day I am going to start training to become an ironman..”. I trained for 12 months. I bought an old racer. And I bought my own wetsuit in Kalmar the day before the race. I had been very weak all July and didn’t feel strong at all when going to Sweden . But Kalmar was like coming home. Cars came with proper triathlon bikes on the roofs. I had never ever met a triathlete before. 15 minutes before the start I laid on my back, in my new wetsuit, and I was so tired I could hardly lift my arms. I have never felt tired like that afterwards, except at the finish line. When I did put on my goggles 60 seconds before the start, the rubber band broke. I was the last man to enter the water, but it was warm and calm and the swim was nice. The swim was crowded with people like my self, doing 50 meters free swim and 10 meters breast. We all went zigzag. Things were going fine, but I did one very big mistake. I swallowed lots of water. I finished at 1 hour 39 and there were still bikes in the transition zone. After 30 minutes at the bike, I started to throw up. And I kept doing so every half an hour during the rest of the day. I got into the routine and tried to eat and drink properly, as I knew what was to come. I realised that the water I had swallowed had seriously messed up my stomach. My speed was excellent for the first 80 km’s, above 30 km/h . Then I faded. My speed the next 100 km’s were below 25 km/h . Of course my bike was not well prepared either. So I had to keep the gearing thing stable with my hand all through the second half of the bike leg. The first time is supposed to be difficult. It was a relief to leave the bike and put on my running shoes. The run was 4 rounds of 10,5 km . It was a warm and sunny day with 28 degrees C. I drank and ate well. And I throw up every half an hour, as regularly like a Swiss watch. The first 14 kms went ok and I kept a pace at a bit over 6 minutes pr km. The first 10,5 km round was 1 hour 10. Then I hit the wall. I was freezing cold, I throw up heavy and outside my 30 minutes interval. I lied down in the red-cross tent for 15 minutes. Then I walked slowly towards the transition zone. I tried to measure if I could still make the cut of at 15 hours, but my brain didn’t work. The second round was 1 hour 55. Red cross must have reported to the race doctor. When I came to the transition zone, the race doctor didn’t like my looks and told me to leave the race. It takes more than a Swedish race doctor to make a kid from Telemark leave the party. Things always goes up and down. Except the food that went down first and then up. I ran slowly but with a sense of control at the third round in 1 hour and 24. I thought I saved energy for a little sprint at the final round. The final sprint was about 5 km. At the last 5 km I was zombie. A friendly female Swedish competitor took care of me and followed me to the finish line. That was smart, because I had lost my sense of direction. I could not remember the roads even if it was the fourth round. She told me that she would only do an ironman this one single time. I knew I had to do this again. The last round was done at 1 hour 29. The kids followed me the last 50 meters . I was proud. They also. I was not much of a company after the finish. At 11 pm Hege took me to the hospital, because I could not stop throwing up. There were seven other fresh ironmen there. It was a warm day. I got intravenous liquid and at 3 am I felt fine and walked back to the camping ground. I was totally high, happy and energetic throughout the first month after the race.